Tools of justice can become inconvenient for those in power when people become comfortable wielding them. That seems to be the message of the motion filed by the St. Louis police department last week asking to lift a restriction on the use of chemical agents like mace and pepper spray. Let’s start at the beginning: In September 2017, a white police officer named Jason Stockley was acquitted of the murder of Anthony Lamar Smith, who was black and suspected of drug offenses. Weeks of demonstrations in St. Louis followed, and some protestors threw bricks and bottles at police. 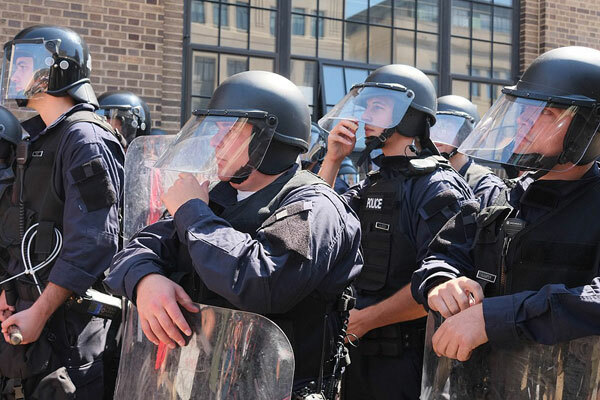 About 300 people were arrested, but most germane to this situation, about 100 people “testified that they were surrounded [in a process of being corralled known as “kettling”], beaten, pepper-sprayed, and taunted as they kneeled or laid on the ground,” according to Jay Connor at The Root. The motion claims that the ACLU has “inveigled the Court into improvident intrusion into police practices in the City of St. Louis.” That’s insulting enough (to inveigle is to “persuade [someone] to do something by means of deception or flattery,” something the courts generally try to avoid), but the motion also claims that because St. Louis did not erupt into full-scale violent riots, “the community (including plaintiffs, though they may not realize it) owes a debt of gratitude to the vast majority of St. Louis police officers.” No doubt there are many times the St. Louis police provided a service for which citizens might be grateful, but this is not one of those times and the protestors were certainly not grateful to be “drowning in mace,” as one person described it. What does “improvident intrusion,” the basis of the city’s complaint, really mean? The motion cites “numerous” suits filed against the city related to the “same conduct” at issue in the ACLU’s suit. (The New York Times reports that nearly two dozen lawsuits have been filed.) This seems to be the main complaint; the motion explains that “the numerous damage suits now pending against defendant City, including actions brought by former plaintiffs in this case, reinforce the conclusion that equitable jurisdiction is lacking in this case.” The city also cited previously unknown evidence (they motion accuses the ACLU of “telescoping” evidence to support their claims) and the fact that St. Louis has experienced no violent riots since 2017. However, the only result of reversing the injunction would be to permit the police greater license to crack down on protests.